After the events of the first book, Freya has joined the Institute – an organization created to help Espers control their powers, and she thought she’d finally found peace. That is until Anti-Esper weapons find their way into the hands of The Coalition, a radical group who is determined to kill anyone with powers. Now Nathan, Freya and the team have to fight both organizations in a race against time before one of the radical groups tips the scales and plunge the entire world into their own version of Armageddon. 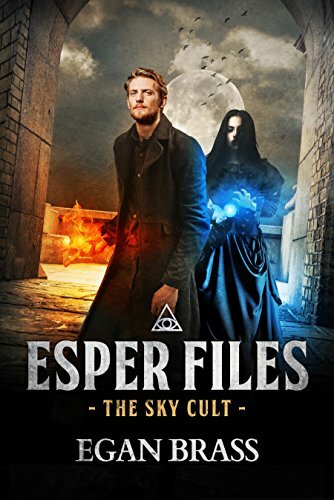 The Sky Cult was a fast-paced, excellent second book to the Esper Files. Picking up shortly after The Esper Files ended, the book starts off with a bang and there are two new villains introduced. Jupiter, who can control thunder and lightning, and Lichtmann who can burn people with his touch and exudes a golden light (he also thinks he’s an angel). Jupiter is the leader of the Sky Cult and he believes that the Espers should rule over the non Espers. Lichtmann’s agenda is to protect Jupiter……as long as Jupiter is in the good graces of the mysterious Hades. Freya is still my favorite character in this series. She is a typical teenager, except she can wield ice like Elsa in Frozen (sorry, I had to put it in there). And her mouth, oh boy, I was laughing in some parts. But, she was also someone you didn’t want to mess with. When the Institute gets attacked by the Anti-Esper Coalition, she was there defending it from the Coalition with her ice powers. Nathan was still as suave as he was in the first book. He was also still absorbing other Esper’s powers. That is something he does by touch. I will say that he did get plenty of action in this book. The poor guy was injured more often than naught….well until he absorbed Red Cap’s powers. The main storyline of the book was great. I loved that there was so much action and the steampunk elements (Hello….airships, RAILGUNS!!!!!!) were absolutely great. If it seems like I am going on a little overboard with the praise it’s because I can count on one hand how many good steampunk books I have read and truly enjoyed. This series is one of them. The secondary characters of this book made it. I cannot wait to see if the Phantom Thief, Red Cap (who cracked me up while reading because while he was so evil, his one-liners that had me rolling) and more of the Espers from the Institute will be featured. I loved the climax of the book. I was not expecting what happened to happen. It threw me for a loop. I also liked the explanation about why Nathan couldn’t absorb Jupiter’s powers. It made so much sense. Well, at least it made sense to me. While the Coalition storyline was somewhat wrapped up and the storyline about the weapons that can cripple the Espers was definitely wrapped up (want to know what that is?? Read that book), another storyline opened up. I am very curious about what is going to happen with it and if we will ever find out who the mysterious Hades is. I also want to know how Nathan fits into this whole insane thing. The end of the book was different and it raised more questions than it answered. Which is makes me want to read the next book. Why: A strong second book that I couldn’t put down. It was full of action and humor, as well as mystery, and I loved it. Plus, it was steampunk and I love, love, love steampunk!! Also, I would absolutely love it if you could check out my review of it on my blog!